I just thought this would be the right place to tell you how thankful I am for AsciiDoctor-pdf. 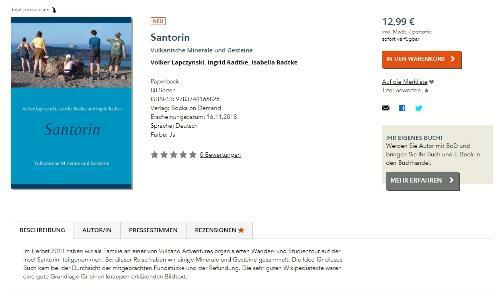 Just a few days ago, I finished writing and publishing a book about Santorini; Rocks and minerals in german language, and it was all done with AsciiDoctor-pdf. Here's how I approached this. The paperback version caused me some headaches initially. Since AsciiDoctor-PDF currently does not prevent widows and orphans, and does not support hyphenation. * For the print version, I manually inserted page breaks ("<<<") to prevent any widows and orphans. Sometimes, it also helped to simply shorten a paragraph or change the size of an image. By adapting the standard theme, I could easily set up the PDF with exactly the dimensions required by Bod.de. Bod costs 19 Euros /year (including ISBN, Ebook). There delivering the print in Europe without extra cost. I am still waiting for the ebook, but the GoogleBook is here. Here are a few things about the AsciiDoctor workflow that caused me trouble, and how I worked around them. * A multipage Index i messing up page numbers on every second page. So i positioned the page-number of the index pages manually with LibreOffice Draw. Thanks a lot especially to Dan Allen for his fantastic work on this software. I really enjoyed working with this toolchain, and I'm sure it hasn't been the last time I used it. Thanks to Daniel Sperl for his text! Thanks for sharing, Volker! The book looks great. I'm so happy to hear that Asciidoctor made writing and publishing this book enjoyable. It means so much to me to hear from authors like you. This is exactly why I do what I do. I hope other authors can learn from your journey.